Stumpa Dúloigh SE Top is the second highest mountain in the Dunkerron Mountains area and the 58th highest in Ireland. Part of the Stumpa Duloigh massif, the southeast top of Stumpa Duloigh is an easy ridge which heads east from the main summit towards Knocknabreda. 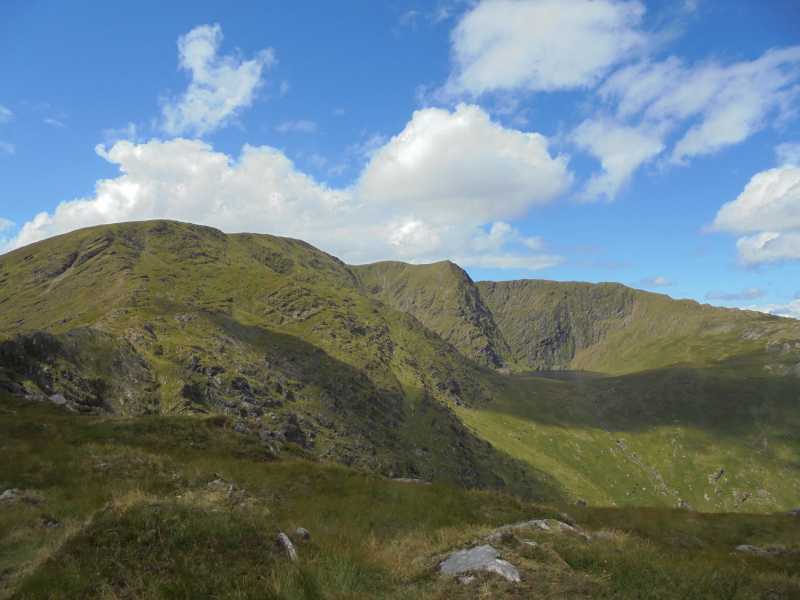 This entire range of hills sits between the Reeks to the North and the Knocklomena to Boughil range to the south with the extended Dunkerron ridge lying to the south west and Molls Gap to the south east. The hill can be reached from the Ballaghbeama Gap, over Knockaunattin and the main top, from parking around V755 781 A. It can also be reached directly from the Gearhameen Valley ascending to the ridge between it and Knocknabreda from the waterfall above Lough Reagh, parking in the valley around V822 813 B This grid reference in the text is shown as point B on the Detail Map above'>V822 813 B B.